Third in the “solar-phenomenon” set of Colors of the Month. I am least fond of this color, because seafoam is a pretty shade but not on my eyelids. This can sheer out but retain some of the interference effects, or (I found, quite by accident) it looks good over a deep olive or evergreen cream shadow. This is the only eyecolor I got from the Signature collection - which was all blues. 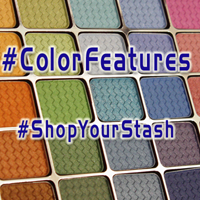 I have colors similar to the other two, but I don’t have a lavender-leaning medium periwinkle. It coordinates well with the medium fuchsia-rose blush from this set, and I don’t know that I’ve seen too many other eyeshadows of exactly this shade from other vendors, indie or corporate.